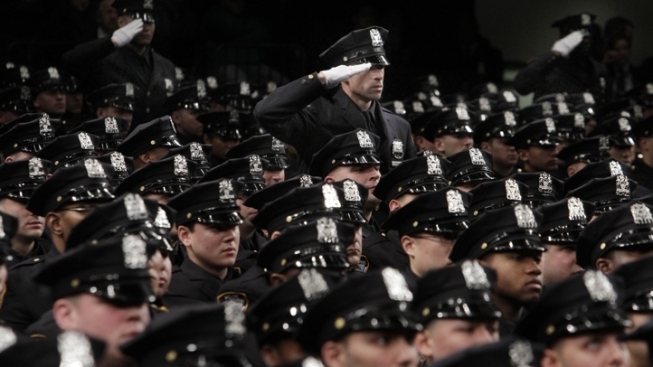 About 1,500 new NYPD officers have graduated from the Police Academy during a ceremony at Madison Square Garden. Mayor Bloomberg and Police Commissioner Raymond Kelly presided over the graduation ceremony Thursday for 1,519 new police officers. The graduates have completed more than six months of training at the academy. The city says they will be assigned to Operation Impact, a program that pairs rookie officers with experienced supervisors and deploys them to targeted high-crime areas. Kelly says the members of this class were born in 58 countries and speak 65 different languages.